ChamberForce - Big-business hiring and workforce tools for every business. Big-business hiring tools for every business. Your community workforce development platform. Custom-built in partnership with Minnesota's largest regional chamber, ChamberForce is an innovative new online platform to help chambers everywhere better tackle your regional workforce development needs. 2017 Business of the Year national finalist from the U.S. Chamber of Commerce. Members of ACCE. Connecting jobs, internships, workforce resources, and people, ChamberForce empowers your chamber members and community in exciting ways based on input from over 200 businesses and nonprofits. ChamberForce can be branded and customized to align with your regional workforce strategy. Our pricing model leverages your chamber’s scale to provide simple yet robust job and internship postings free to your members. ChamberForce is significantly more affordable per posting than other job boards, allowing you to provide our platform as a member benefit and community growth tool. Give every one of your chamber members access to robust hiring tools such as our simple Applicant Tracking System (ATS). Our mission is to put big-business hiring tools in the hands of small businesses and nonprofits who may not be able to afford these valuable technologies on their own. 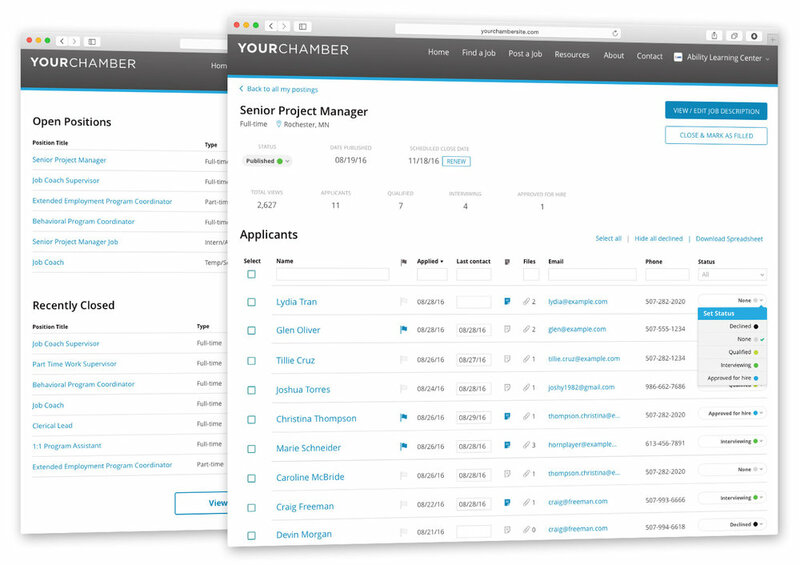 With ChamberForce, applicant tracking workflows are included for everyone. Empower your members to stand out through unique company profile pages and work culture summaries. Job seekers can also sort and filter jobs by perks such as health insurance and flexible scheduling. Instead of just hoping for good applicants, your members can attract them. Local focus with national reach. All of your members's jobs and internships are automatically submitted to the new Google Jobs tool for more views and applicants. No extra steps. Your local resources directory will help both job seekers and employers discover and leverage existing job resources in your community and online, many of which are often underutilized. We can customize the resource categories to fit your unique workforce needs. For employers, our drag-and-drop job form builder is simple, flexible, and fast. Your members can say goodbye to fielding applicants by email or via paper. Optionally, businesses can link job posts to their own online application form. Other job sites charge $$$ for this feature. Instead, ChamberForce makes this free and easy. Mobile-optimized for job seekers and businesses on the go. ChamberForce is also designed with screen-reader accessibility in mind because everyone deserves an equal opportunity. Featured jobs and sidebar ads give added value to members and create additional non-dues revenue to partially offset your ChamberForce operating expenses. Additional opportunities also exist. ChamberForce puts a very tangible and practical workforce solution in the hands of your members, adding clear value to the advocacy and support your chamber already provides. To easily control free platform access for members in good standing, we can automatically sync your ChamberMaster membership list with ChamberForce. ChamberForce creates value for your whole community by connecting jobs, resources, and people from every angle: your chamber, your members, and job seekers. Everybody wins. ChamberForce was designed and built by an award-winning technology company named BrandHoot, along with leadership from the Rochester Area Chamber of Commerce (largest chamber in Minnesota) and input from over 200 businesses and nonprofits of all sizes. ChamberForce is a special blend of 5+ years of ideas and thousands of hours of research, planning, prototyping, and development. We think you'll be impressed. Exciting news! BrandHoot was recently selected as a top national finalist for the 2017 Small Business of the Year award from the U.S. Chamber of Commerce! To our team, our clients, and our fans: thank you! Built by BrandHoot in Rochester, MN.